There’s no denying it: Hamsters are incredibly cute. 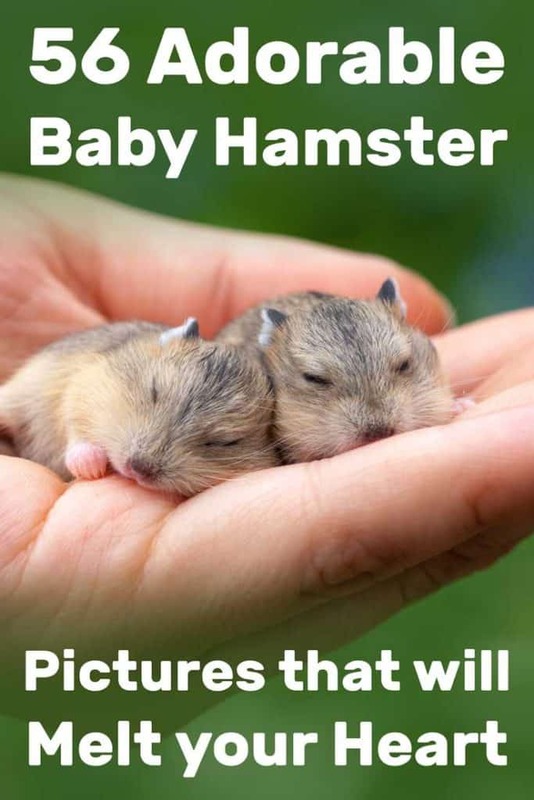 And hamster babies – also known as pups – are the most adorable of all! We’ve hit up the ever-growing community of hamster lovers on Instagram to collect some of the best baby hamster pictures that the internet has to offer. Before we dive into this collection of pictures, let us stress something very important: You should not breed hamsters! Only registered breeders should be trusted to breed hamsters ethically and healthily. If your hamster has become pregnant (or you adopted them pregnant unknowingly), you shouldn’t disturb the natural birthing and pup rearing process by taking pictures. This can stress out a hamster mama and even prompt her to eat her pups. Click here to read our article about why mother hamsters sometimes eat their young. 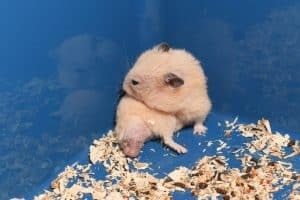 Should you find yourself suddenly in charge of a new mother and her pups, read our guide to hamster pregnancy and birth. Regardless of whether or not you have a hamster, this list is going to brighten your day! This sleepy Syrian is on their way to their new home! It looks like this little baby is already making himself comfortable! Hamsters love to doze during the day, so his owner can expect to see a lot of this. Hamsters love to eat and store food in their big cheek pouches. This winter white hammy could be stopping by the dish for a quick lunch, or maybe they’re looking to bring food back to their house or burrow. It’s important to stay hydrated, and these winter white pups know what’s up! Dwarf hamsters often live in pairs, but these babies are young enough to share space as a group. Unlike their dwarf cousins, Syrian hamsters have to live alone once they reach eight weeks of age. These 3-week-old Syrians still have time to enjoy each other’s company! This pair of dwarf hamsters is spending a lazy day cuddled up together. Dwarf hamsters can live with a roommate, but it’s always best when they share a cage with someone of their same dwarf species. 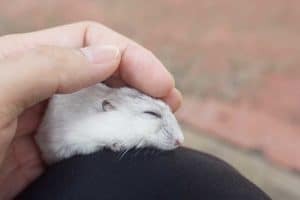 Hamsters can be quite affectionate and learn how to be handled by their owners. This baby is spending some quality out-of-cage time with its owner. Hamsters love to play around in open spaces, like this tiny hammy here. Remember that a hamster’s body is delicate, so make sure to play in a safe, level area. Check out this little guy! 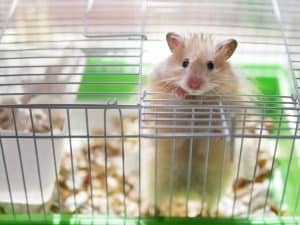 Hamsters love to run and having a wheel in their cage helps them to burn off excess energy. It also helps keep them from being bored. Some hamsters are especially active, with a love of jumping and climbing. That’s the case for this hammy here, who has gotten on top of his or her hamster house. A baby Chinese hamster can easily fit into the palm of your hand! Whenever you want or need to lift your hamster, make sure to hold them with both hands like the owner in this picture. You don’t want your hammy jumping away from you! Hamsters have only a short window of time where they can safely share a space. These hamster pups are still young enough to live with each other and their mother. And they don’t seem to mind the company! What’s better than one baby hamster? Two baby hamsters! This hamster was photo-ready for this adorable shot. When they actually stay still, hamsters are great photography subjects. These hamsters might still be babies, but they’re already hard at work! Talk about tiny! Newborn and days-old hamsters are incredibly small and need to be handled very delicately. There’s a goofy one in every pair! Each hamster has a personality all their own, just like we do. Hamsters can be trained to be handled, just like the well-behaved hamster baby here. Hamster houses provide a space for burrowing, sleeping and storing a hamster’s favorite food. This trio doesn’t mind peeking out for a quick photo-op. It seems that this baby wasn’t expecting a guest today. It looks like this baby already knows how to strike a pose! Latte the hamster is enjoying a leisurely afternoon rolling around in her bedding. Hamsters will use their bedding to burrow and even carry it around their cages in the cheeks! The tiny baby here certainly doesn’t seem to mind being in the spotlight! Even if you live the leisurely life of a hamster, it’s important to have a place to go and unwind. This hamster has a little tent, constructed of natural materials for their safety. Those are some pretty sweet digs! Big eyes and even bigger ears make for an adorable combination for nearly any animal. This hamster is exploring the natural elements of their cage and looking impossibly cute while doing it. Hamster balls are a great way to burn off energy, and this hamster is getting ready for an energy-burning session of their own. Hamster babies certainly don’t need filters to look cute, but who wouldn’t say “aww” at this little pirate? This cheeky, little wink was captured at exactly the right time! Even with eyes as big and as bright as these, hamsters have pretty poor vision. But, just like this hammy here, most hamsters don’t let this keep them from living their best life. The owner of this winter white hamster baby was lucky enough to capture their pet making this adorable expression! Dress-up isn’t just for dogs and cats. Look at this hamster rocking his little hat! Baby hamsters are incredibly curious and inquisitive creatures. If you have a hamster of your own, you’ve probably seen this expression countless times. It’s important to get enough rest, and this dwarf hamster seems to appreciate the value of high-quality sleep. Hamsters tend to be more active at night than they are during the day. Though hamsters originate from deserts and other sandy areas, they can enjoy the full blossoms of spring, too. This baby hamster is out on a nice stroll and taking the time to smell the flowers. Smile! When you live the life of a happy, little hamster, there is a lot to smile about! This hammy baby is catching up on some much-needed sleep. Running, playing, climbing and jumping all day sure takes it out of you! What’s cuter than a picture of one baby hamster? A picture of six baby hamsters! This hamster looks like they need to have a very serious conversation with you. Almost anything can be a bed if you’re creative enough. Hamsters love cozy, small housing opportunities like this one. This baby is happily exploring his or her environment. Most hamsters love to poke around and learn about their home. Just make sure that yours does it under your close supervision! Cozy house? Check! Comfy blanket? Check! Yummy snack? Check! This hamster is living the high life. Tunnels offer hamsters a world of possibilities for exploration and exercise. This dwarf hammy certainly seems to have taken to their plastic tunnels! Tunnels are also a great place to take a little snooze! Who wouldn’t fall in love with this squishy hamster baby? Snacking is very important when you spend your waking hours being as active as this little guy. This hamster is enjoying a tasty treat given to them by their owner. Treats are a great way to occasionally introduce new flavors and textures to your baby or adult hammy. “Beep beep!” Sure, hamsters can’t drive, but it’s fun to imagine. The roborovski hamster in these pictures sure looks like they’re excited to see you! This close-up shot of a sleepy hamster is what our dreams are made of. Here we’ve got a 10-day-old litter of hamster pups. In a little less than two months, these hamsters will be ready to be removed from their mother and placed in their own cages. Just a baby Syrian hamster, hitching a ride in his owner’s shirt pocket. These babies are so small that three of them can fit in the palm of their owner’s hand! We hope you enjoyed these baby hamster pictures! If you did, please share the post with your friends to show them just how adorable hammies can be!